An ISO image is an archive file (also known as a disc image) of an optical disc, including all the data of files contained on the archived DVD. 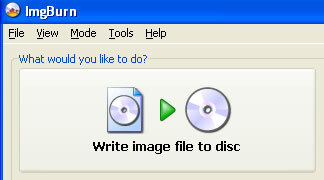 In the last step of creating slideshow DVD with Photo DVD Maker, choose DVD as output format, de-select the “Burn to DVD+R/RW DVD-R/RW CD-R/RW” option, select “Create Disc Image File”, and specify a file folder to store the ISO file, and give the disc image file a name, and then click the “Burn Now” button to create a disc image of the photo slideshow DVD. Once you have saved your photo slideshow DVD as disc image to hard drive, you should be able burn it to DVD disc with third party burning applications. If you have Nero installed, you can use it to burn the ISO image of the photo slideshow DVD to disc. You can also try the notcable free image burning application, ImgBurn, to burn the ISO image to disc.